“Alexa, arm my security system.” Scout is the ultra-flexible security system that lets you customize your hardware and monitoring plan. But is it reliable enough for trusting your home security with? Our Scout security review will help you decide. Security systems are typically an expensive commitment requiring a long-term contract. There are a few DIY systems out there, and one of the newest ones is Scout. 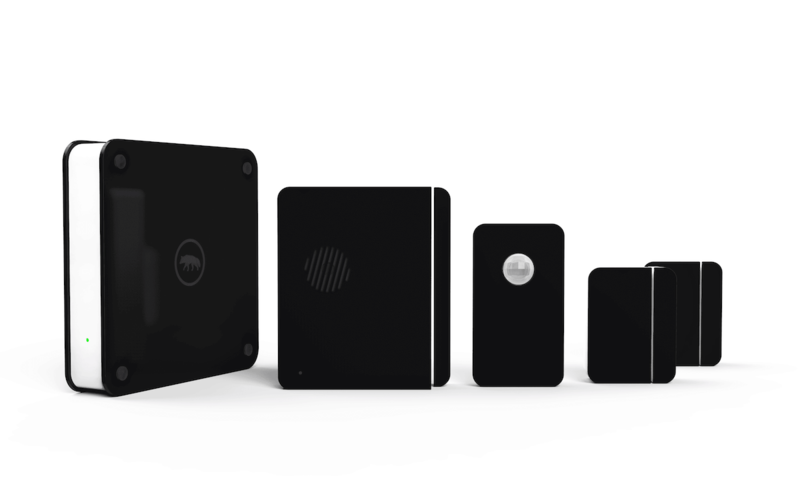 We installed and tested the Scout security system and found it to be an easy-to-use, sleek option, but there are some important things to know before purchasing. Read on. Affiliate Disclosure: This page contains affiliate links, which earn us commission at no cost to you. Disclaimer: The writers of this article received a review unit for a few weeks before returning it. They were not compensated in any way. The opinions are 100% their own and not influenced. 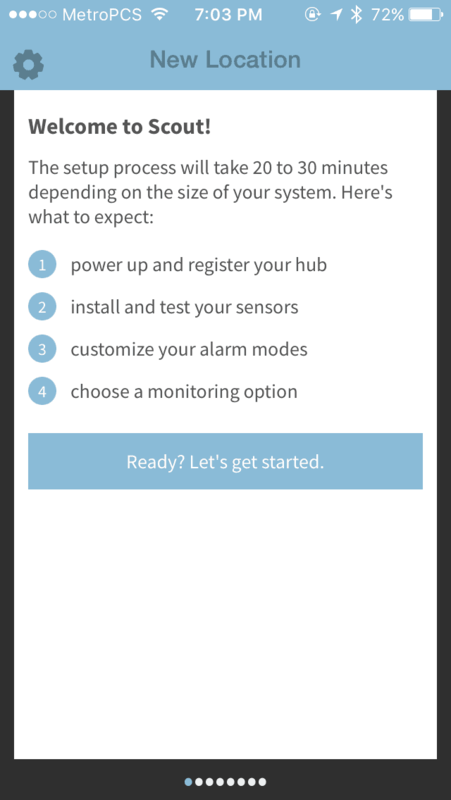 Instead of reading about how to install the system, I went into the process as any new customer would, by downloading the app and following the step-by-step directions on screen. As a tech writer, I’ve set up a lot of smart home gadgets. Surprisingly, Scout was one of the easiest to set up. The app walks you through each step for connecting the hub or base station to your router and getting the sensors to sync with it. You pull the battery tabs for one device at a time. After the tab is pulled, the sensor automatically begins connecting to the hub. The base station will beep and the app will show when the sensor has connected. 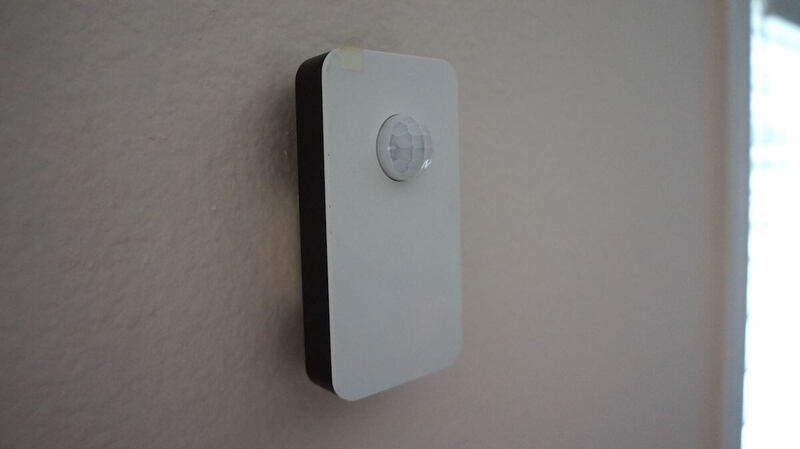 You can easily test whether its connected by opening and closing the door or waving in front of the motion sensor. After you are sure they are connected to the network, just peel and stick the sensor into its position. 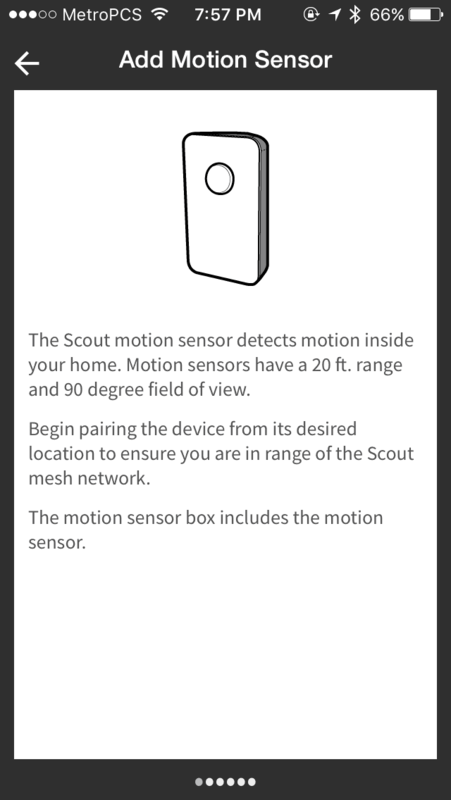 When I set up my system for this Scout security review, I had to remove and re-stick a few sensors, but I followed the directions in the app for this: just twist the sensor 45 degrees to the right for minimal wall damage. It was easy to remove, which means you could pack it up if you move to another home. Plenty of homeowners leave their security system behind when they move, but that doesn’t have to be your only option thanks to Scout. If something isn’t working like it was supposed to, you can simply select “something’s not right” in the app and it will pull up common questions that arise during that part of the process. The entire system is a mesh network, so each device works like a range extender. For this reason, Scout recommends enabling the sensor that you will install closest to your router and then working out to the farthest one. Scout touts a modern design with custom finishes in different colors. While the different shades of black, brown, and white look nice, the sensors themselves are very large. When setting up for our Scout security review, we had a few old sensors around the house from a previous alarm system and found that the Scout sensors were twice as big. This may be due to the mesh network and smart capabilities, but it’s worth noting for installation purposes. 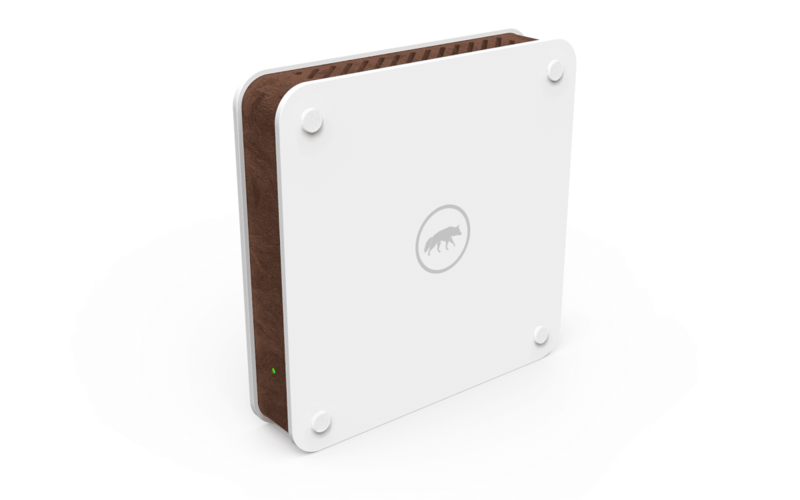 The base station communicates between all of your sensors and your router. It has a siren to notify you when the alarm has been triggered. It works under the Zigbee and Z-wave protocol, which is unique since its competitors like SimpliSafe do not (for full comparison with SimpliSafe and Nest Secure, click here). The base station also has a battery back up in case of a power outage. Door panel: This has a (loud!) siren inside. You can have several door panels if you want one for your back door or garage entrance. 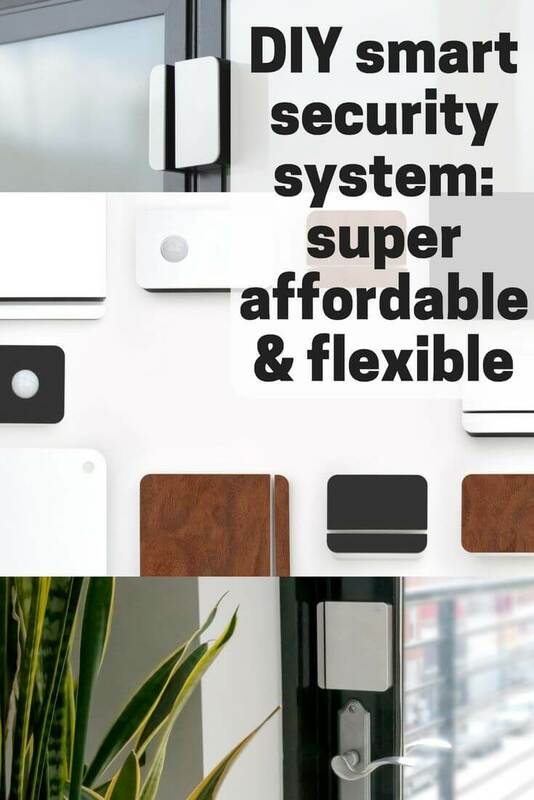 Access sensor: Whether you decide to use it on a window or a drawer with valuables, the access sensor is super versatile. It works the same way as the door panel, but it’s smaller and doesn’t have any siren. Motion sensor: This device can detect motion up to 20 feet away and trigger the sirens or send an alert to your phone. The door and access sensor are equipped with magnets. This makes it so they do not need to touch in order to keep your home secure. As long as the two pieces are no more than an inch apart, the sensor will read if the door/window/drawer is opened or closed. Sensors run on batteries, which is what makes them easy to install since they are wire-free. I haven’t had a chance to test the battery life for this Scout security review since my system hasn’t been set up long enough. Amazon reviews for the first version of Scout say that the battery life is less than stellar, with many saying that it lasts around four months despite Scout saying it should last nine months. The version I’m testing (hardware version 1S) is re-engineered for improved battery life of over a year, so this will be a big improvement for Scout users. Battery life depends on hub connectivity, sensor testing, and overall use. 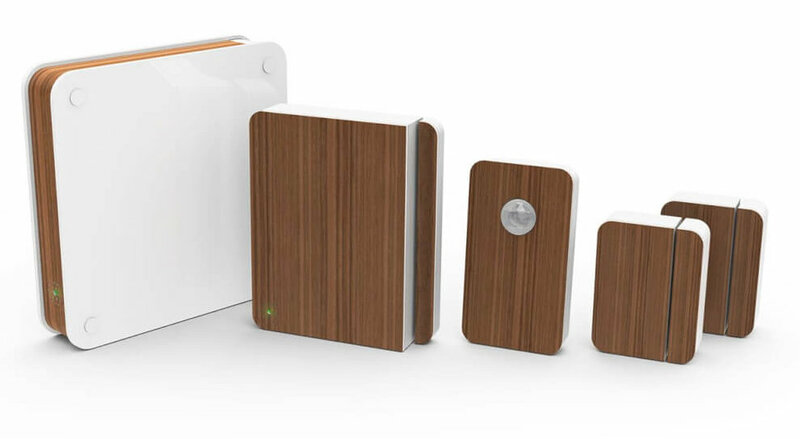 The included key fobs and RFID sticker can disarm the security system with a quick swipe. This is a good solution for when you walk in the door and the system gives you a warning beep that the alarm will go off soon. 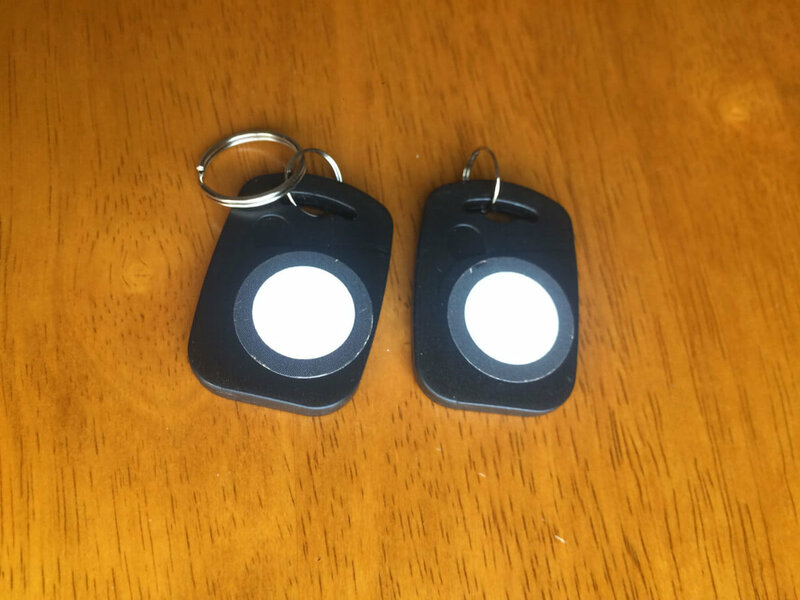 The key fobs easily attach to your keys, while the RFID sticker is designed to be placed on a random object in your house. That way, if you lose your keys, you can still disarm the system using the sticker. 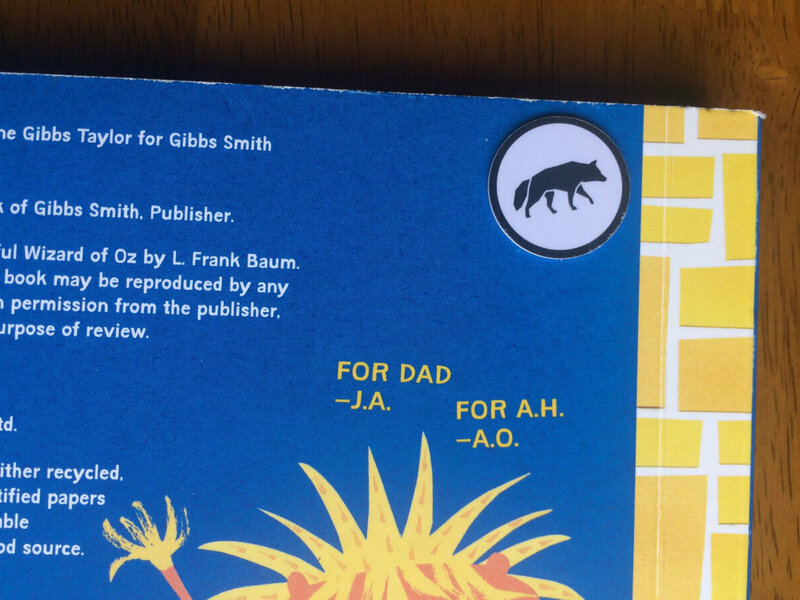 I attached my sticker to a kid’s book that stays in my front room area. I had a hard time syncing the key fobs at first during my Scout security review, but then after I contact customer support I realized I was swiping wrong. This video shows the best way to swipe the key fobs and RFID stickers to have them sync or read easily. It’s tricky at first, but once you get the motion down it gets easier. The starter kit comes with a base station, door panel, 2 access sensors, a motion sensor, 2 key fobs, and one RFID sticker. You can also mix-and-match your own combination of sensors by buying whatever your home needs and skipping the rest (besides the base station, which is not optional). This is the part of Scout that we like best of all. You aren’t locked into specific technology or packages; you can customize it for your unique home. Without paying any fees, you can arm and disarm your Scout alarm system at the door panel. Fees are optional with Scout, but selecting the free plan really limits your ability to fully use the system. The paid plans enable push notifications, along with other features. If you want to remotely arm/disarm your system, you need to pay monthly fees. This service starts at $9.99 per month for 4G LTE backup and goes up to $19.99 per month for 24/7 monitoring service with police dispatch. I was impressed with Scout’s service after upgrading to the Always On $9.99 plan for my Scout security review. I received an email letting me know that the cellular reception for my security system was weak. This kind of proactive improvement goes the extra mile before connectivity issues arise. These two-tiered plans make it easy to save money if you are wanting to spend less on home security. All plans are available in month-to-month payments so that you aren’t locked in, but if you commit to a yearly plan, you save 10%. The Scout app is very easy to navigate and use. It’s available in iOS and Android, in addition to a web app. 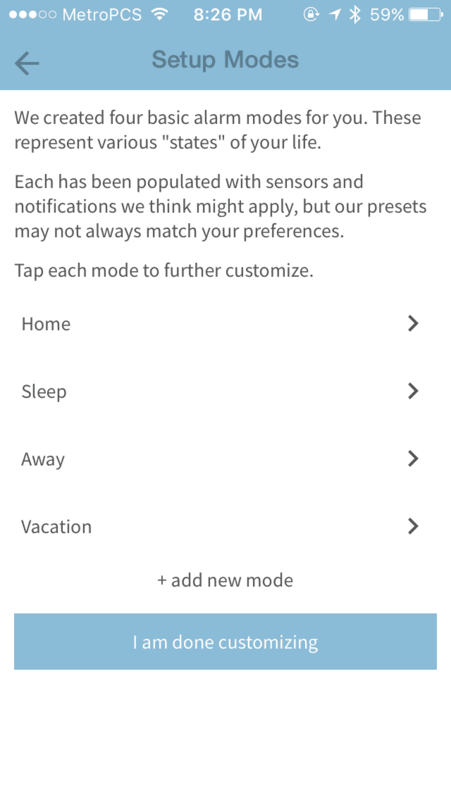 The app pre-populates four modes, which you can easily customize: Home, Sleep, Away, and Vacation. You can edit the modes to select what types of notifications you want to receive when the security system is breached. So if your home is set to Away mode while you’re at work and it sees that a window is opened, it can email you, sound the siren, or give you a phone call, among other options. Notifications were fast and came at the same exact time that the alarm sounded. Modes are in an easy if-this-then-that format, allowing you to choose which sensors to arm in different modes. For example, I only arm my motion sensor in Vacation mode so that it isn’t triggered by my dog during the day while I’m at work. This is another area where Scout has an advantage. Rather than submitting to whatever the alarm system company decides is right, you can customize your responses to break-ins. Have your smart lights turn on, open your garage, or instruct Scout’s monitoring team to call the police. All of the rules are set up in advance, saving you the headaches of false alarms or slow response time when emergency strikes. When I tested the app for this Scout security review, my favorite feature was the history. The app has a descriptive history of activity from across all sensors. 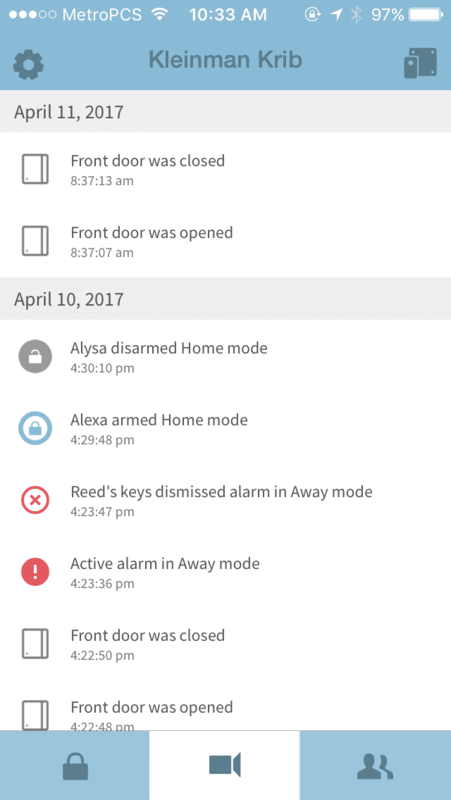 If you want to see when your teenagers got home last night or just check that the noise that you heard was not the front door opening, the history gives all of the details about recent activity like arming/disarming, alarms, open and closed sensors, and more. What’s missing in the Scout app? Well, there’s no panic button at the present time. If your home was unarmed, but you knew someone broke in, or even if you wanted to alert your family of fire or some other danger, the ideal is to turn on the siren using some type of panic button. The best work around at the moment is an IFTTT trigger that lets you turn on the siren manually. Hopefully, Scout will add this in their app soon. 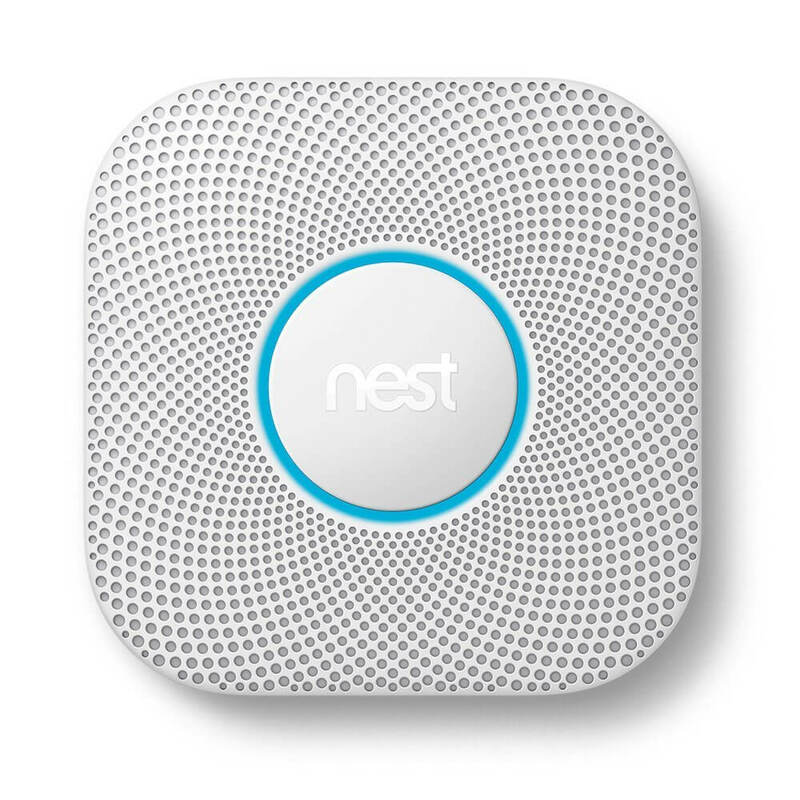 Nest: This is a great integration because it covers Nest thermostats, security cameras, and Nest Protect CO monitor. You can have the alarm sound if Nest Protect detects CO or smoke, or automate the thermostat based on when you arm/disarm the house. Activity from a Nest cam will also appear in your Scout timeline, making it convenient to manage all security and notifications in one place. 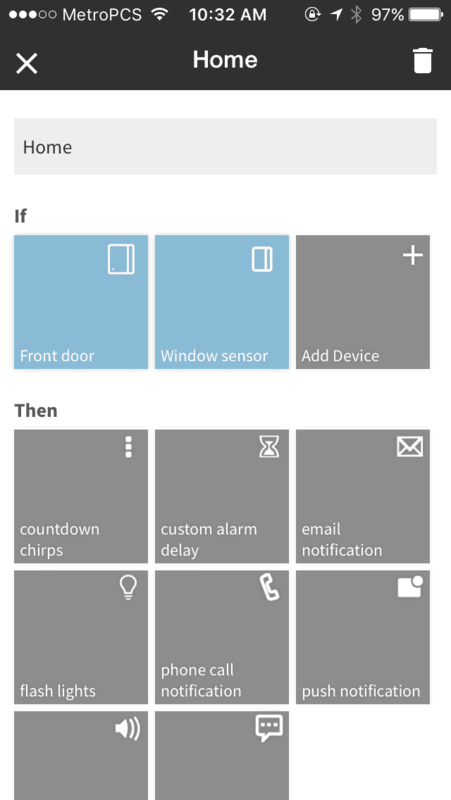 IFTTT: If-This-Then-That lets you set even more rules for your Scout security system. Set it to disarm at a certain time each day, or arm when you leave home. 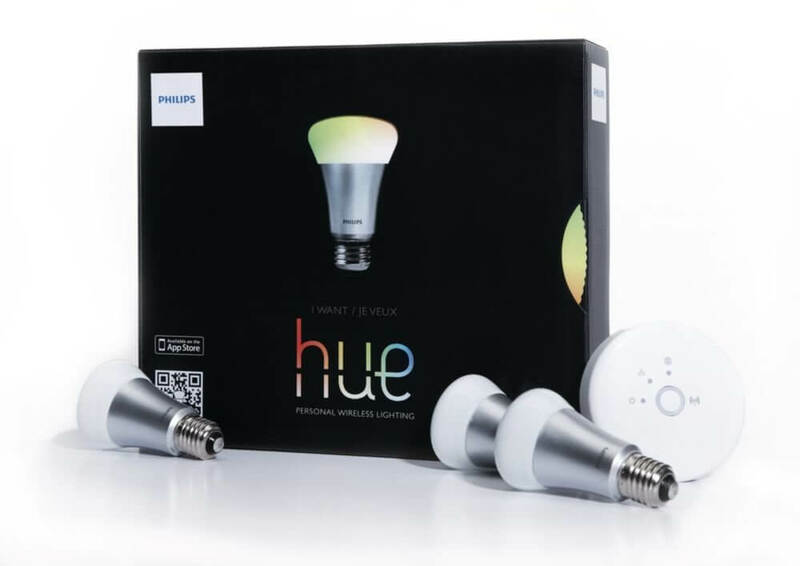 Philips Hue: When the alarm is triggered, have your lights flash to provide an additional warning. LIFX: I integrated my LIFX smart bulbs for this Scout security review. The lights can flash with the siren, just like Philips Hue. To activate this, I simply logged in with my LIFX credentials and specified which modes I wanted to have flashing lights. It took less than two minutes to connect the two devices. 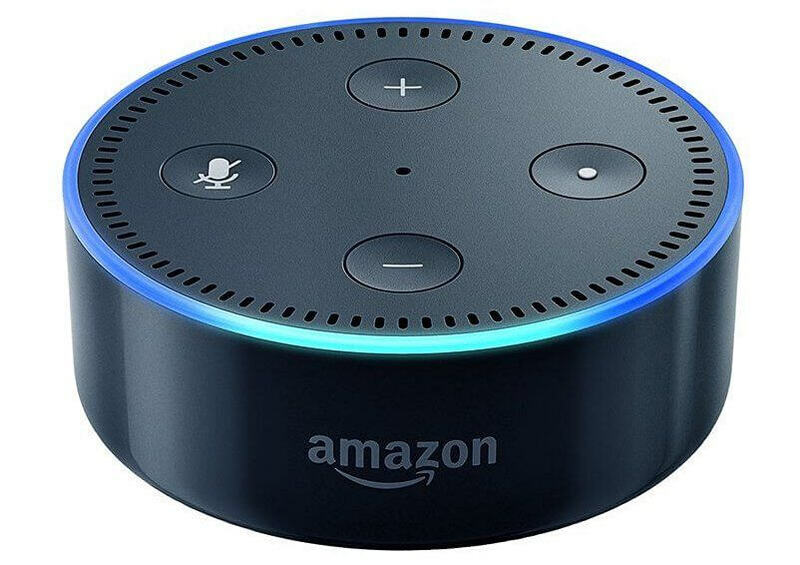 Amazon Alexa: Using Alexa, you can arm, disarm, or ask the history of your Scout alarm. To disarm, you have to provide a unique four-digit code that you specify when setting up your account. This prevents someone from shouting through your window to disarm the system. Samsung SmartThings: This hub is connected to dozens of smart home devices, allowing you to automate your security system with other items around the house. I was skeptical of Scout at first since it has some harsh Amazon reviews, but it quickly won me over. Many reviews appear to be outdated or inaccurate—Scout was really reliable for me, and any issues were quickly resolved by the support team. Scout integrates seamlessly into the biggest brands of popular smart home products. It can match any lifestyle by mixing different types of sensors together for complete security. Its peel and stick set up was simple, and the app instructions are some of the most helpful I’ve ever seen in the smart home space. The system isn’t cheap, but its value and low monthly fees can help it pay for itself quickly just in savings. There’s our complete Scout security review. 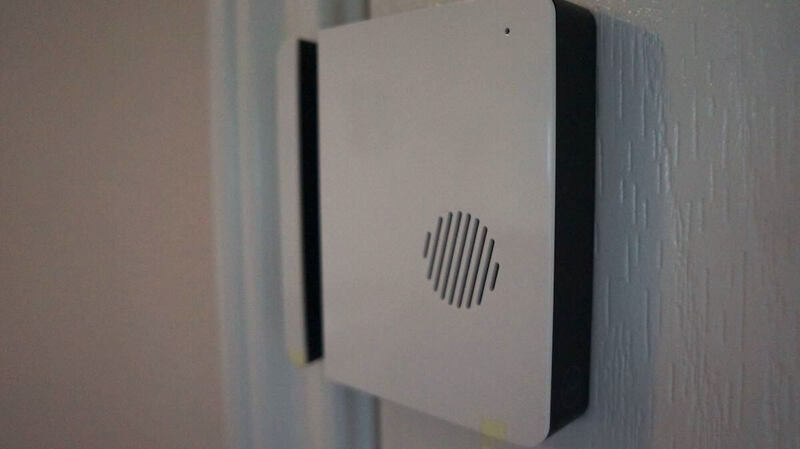 What’s your opinion of the Scout alarm system? Let us know in the comments!